One of my favourite things to teach my buddies is reading. Perhaps It is because I love reading myself, or maybe just because I feel that once my buddy masters reading, the doors are opened to learning everything else. Over the years I have employed many strategies to help my buddies learn to read, but I've never placed any pressure on them to learn anything. We always do things that my buddies enjoy. I'm very conscious of the fact that if learning is made to be unpleasant, my buddies will lose the desire to learn. That would be devastating! If you're ever working with your child to learn something and either of you is not enjoying it, take a break and come back to it another time. 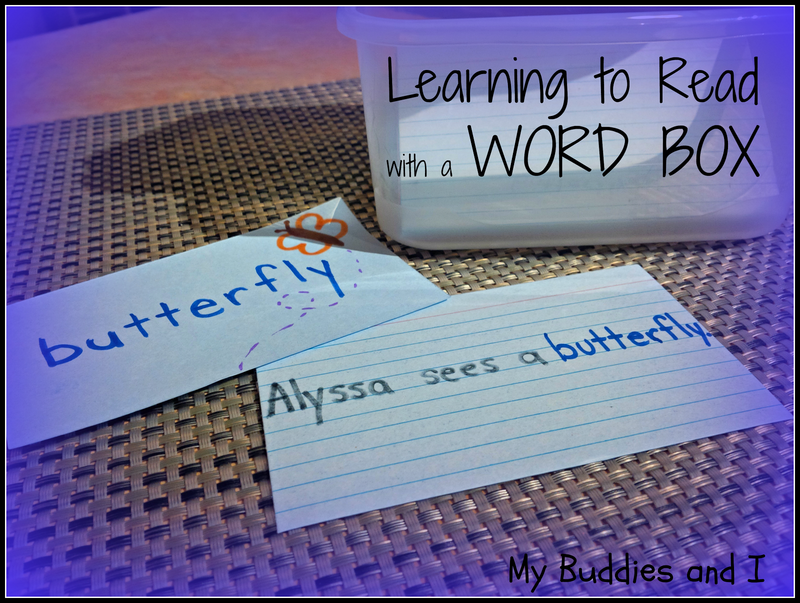 One of the activities I have used successfully with my buddies was a Word Box. I would provide my buddy with a recipe box. I had a box of my own, filled with blank cards. 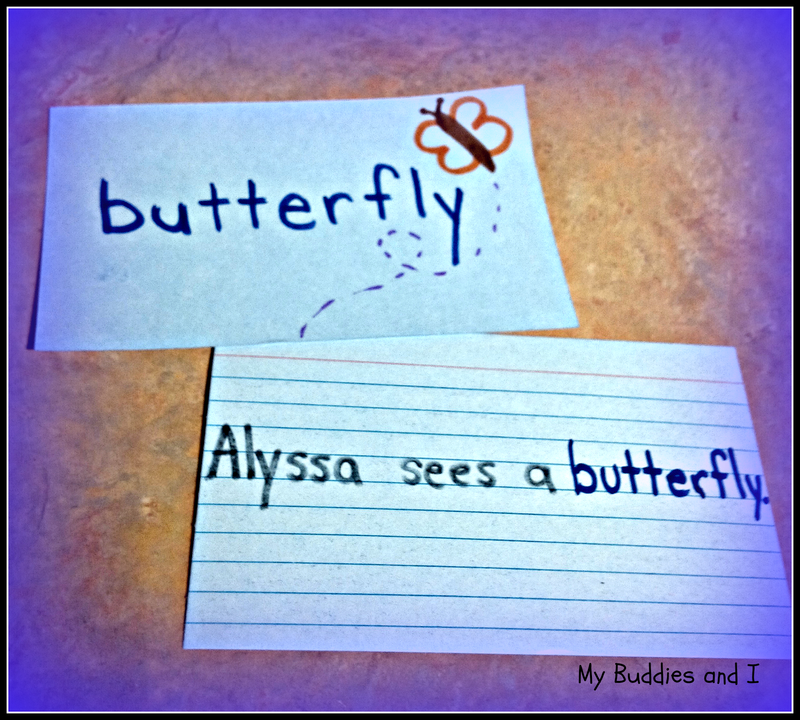 Each day that my buddy attended daycare, he or she had the opportunity to dictate a word that I would write on a card. (I learned to use a permanent marker to hold up to all the handling without smudging.) Then my buddy could trace over the word or draw a picture to go along with it. I would write a sentence on the back of the card, using the word that my buddy had given me. I would emphasize their word to make it easy to distinguish from the other words in the sentence. Then I would read the sentence to my buddy, running my finger under the words as I read them. I would have my buddy read the word to me and most often, my buddy would also be able to read the sentence back to me. This was always so exciting and gives us both a feeling of instant achievement! The next day, we would review the previous day's word(s) and add a new one. As long as my buddy was easily reading and remembering all the words in their collection, I would add another one. When they would struggle a bit, I would hold off on adding a new one . When my buddy had a big collection, we might weed some of them out. I might add an extra sentence to the backs of the word card. I've always found that my buddies learned their big words more easily than some of the simple sight words that are taught. By using their big words in sentences, they were getting the benefit of BOTH! And they enjoyed it! I loved this method of teaching reading because it is very individualized. If you have a preschool child who is keen to read or a child in school who is struggling with reading, this could be the perfect solution. Kids can progress at their own pace and it gives them a lot of control over their own learning. They have the power to choose the words and decide if they want to trace the word or add pictures or both. They can even decorate their word boxes if they wish. It's really important to make sure the activity is fun. When they struggle to sound out a word, try helping by putting your finger under each letter and giving each individual letter sound and allowing your child to link the sounds to figure out the word. If they don't figure it out right away, give the sounds again, this time allowing a smaller gap or even begin to blend the sounds together. If they struggle to read the sentences on the back, read them for your child, but pause at their word for them to read. If they still don't remember the word, go back to the front of the card and have them read it on that side then flip it over and ask them to find the word in the sentence. Even without being able to read the word, just looking at it and retaining the image of it to recognize on the back of the card building future reading skills. Let your child own their word box and show it off to anyone who would like to listen to them read. This is a great motivator for kids, too. Some of my buddies would proudly carry their word boxes around for the better part of the day and even play with their cards on their own. 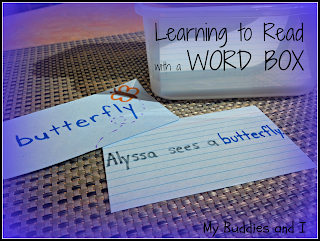 I'd love to hear if you try this out with your child or if you have your own reading ideas, I'd love to hear those too!